14ymedio, Yoani Sanchez, Havana, 15 August 2016 – The baby cries in her cradle while her mother sings to console her. Barely three months old, her name is Michelle, like Barack Obama’s wife. This little Havanan who still nurses and sleeps most of the day, came into the world after the armistice: she is a daughter of the truce between the governments of Cuba and the United States. A creature without ideological phobias or hatred on her horizon. In the history books that Michelle and her contemporaries will read, these months after 17 December 2014 – “17-D” as Cubans have dubbed it – will remain in a few lines. In these retrospective summaries there will be optimistic tones, as if the whole island, stranded for decades on the side of the road, had set out anew from this moment, putting pedal to the metal and making up for lost time. But, for many, living through the reconciliation is less historic and grandiloquent than was playing a starring role in a battle. A process that, one day, analysts will compare with the fall of the Berlin Wall and perhaps define with high-sounding names like the end of the sugar curtain, the death of the Revolution or the moment when peace broke out, is losing brightness now, faced with the daily exhaustion. Indeed, the truce quieted the noise of the slogans and has allowed us to hear the persistent hum of the shortages and the lack of freedom. The day when the presidents of Cuba and the United States announced the beginning of the normalization of relations has been left somewhere in the past. It will be a reference for historians and analysts, but it means little to those who are facing a whether decision to spend the rest of their lives waiting for “this to be fixed” or to choose to escape to any other corner of the world. 17-D has increased apprehensions about the end of the Cuban Adjustment Act. The number of Cubans who, since then, have crossed the United States border has shot up, with 84,468 arriving by land or air while another 10,248 have tried to cross the sea. The popular ironic phrase of the latter for leaving the island –“turning off El Morro,” a reference to Havana’s iconic lighthouse at the entrance to the bay – dramatically foreshadows those numbers. Why not stay in the country if the thaw promises a better life or at least a more fluid and profitable relationship with the United States? Because 17-D arrived too late for many, including several generations of who had to face off against our neighbor to the north, shouting anti-imperialist slogans for most of their lives and abetting the commander-in-chief in his personal battle against the White House. They don’t trust promises, because they have seen many positive prognostications that survived only on paper and in the mystique of a speech, lacking any impact on their dinner tables or their wallets. 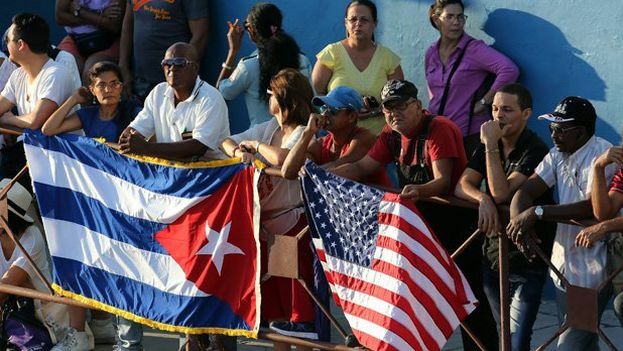 After a prolonged skirmish lasting over half a century and eleven US administrations and two Cuban presidents with the same surname, the nation is exhausted. The adrenaline of the battle has given way to dreariness and a question that finds it way into the minds of millions of Cubans: Was it all for this? It is difficult to convince people that the confiscations of US companies, the diplomatic insults, becoming the Soviet Union’s concubine, and the many caricatures ridiculing Nixon, Carter, Reagan and Bush were all worth it, even with all the official propaganda that controls every one of the county’s newspapers, radio stations and TV channels. The American flag raised at the US Embassy in Havana just one year ago, on 14 August 2015, put a final end to an era of trenches and to the eternal soldier: the Cuban government with its still hot Kalashnikov and a marked inability to live in peace. It is prepared for confrontation but its ineffectiveness is clearly evident in times of armistice. In his convalescent retirement, Fidel Castro noted how the country he molded in his image and likeness was out of his hands. The man who controlled every detail of Cubans’ lives cannot influence how he will be remembered. Some rush to deify him; others sharpen their arguments to dismantle his myth; while the great majority simply forget he’s alive: he is buried while still breathing. Children born since 31 July 2006, when the illness of the “Maximum Leader” was announced, have only seen the president in photos and archival materials. They are the ones who don’t have to declaim incendiary versus before him in some patriotic act, nor be a part of the social experiments that emerged from the gray matter under his olive-green cap. They live in the post-Fidel era, which does not mean they are entirely freed from his influence. For decades to come, the schism created by the authoritarian leadership of this son of Galicia, born in the eastern town of Birán, will divide Cubans and even families. The aftermath of this tension that has infiltrated the national identity, otherwise lighthearted, will last for a long time. There will be a before-and-after Castro for the followers of the creed of political obstinacy he cultivated, but also for those who will breathe a sigh of relief when he is no longer. The Maximum Leader’s 90th birthday, celebrated this August 13 with cheers and a good dose of personality cult, has all the earmarks of being his farewell. Now his closest family members should be exploring the calendar to select a date to announce his funeral, because such a huge death won’t fit just any date. They will have to pick a day that is not associated with the memory of some offensive in which he participated, a project that he opened, or some lengthy speech that hypnotized his audience. There will be no need, in any case, to disconnect the machines or to stop administering medications. To say the final goodbye, it will be enough to give him his measure as a human being. Forget all those epithets that extolled him as “father of all Cubans,” “visionary,” or “promoter of medicine” on the island, along with “model journalist,” initiator of the “water-saving policy”, “eternal guerrilla,” “master builder,” and a long list of other grandiloquent titles that have been repeated in the days before his birthday. Fidel Castro and Michelle, the little baby born after the visit of Barack Obama to the island, will be together in the history books. He will remain trapped in the volume dedicated to the twentieth century, although he has made every effort to put his name on each page dedicated to this nation. She will star, along with millions of other Cubans, in a chapter without bloody diplomatic battles or sterile confrontations. Editor ‘s Note: This text was published on Monday 15 August 2016 in the Spanish newspaper El País .